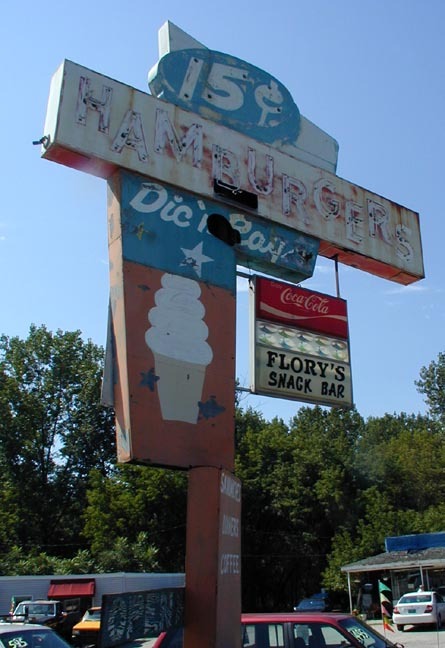 Flory's Snackbar & Diner looked more like a junk shop than an eatery in 2003 when this photo was taken. The former Flory's Motel and Flory's Plaza was located next door. As of 2006, the Diner had closed and the sign has fallen to the ground. In 2009, what remained of the sign was still on the ground. In 2014, a fire destroyed what remained of the buildings. This remains of this sign must be gone now.